London, UK, 4 April 2019 – The container shipping industry is facing an exceptionally high level of uncertainty, ranging from the extra cost associated with IMO 2020 and how much carriers will recover from shippers, to the possibility of a trade recession and unknown future engagement by shipowners in large vessel building programmes, according to the recently published Container Forecaster from global shipping consultancy Drewry. Drewry anticipates that the industry will be close to equilibrium by 2023 with its Global Supply-Demand index reaching a reading of 97.1 (100 representing perfect harmony). The latest report explores the potential ramifications of the new IMO low-sulphur fuel regulations from 2020 on supply and demand, freight rates, liner profitability and the consolidation trend. 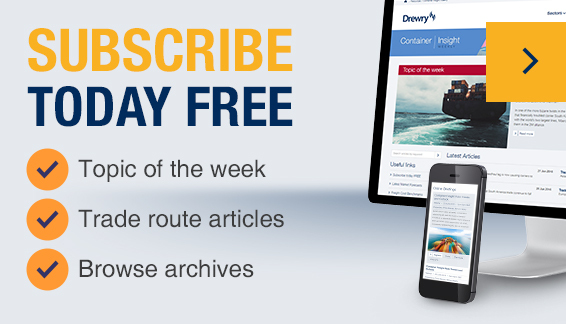 Drewry expects strong resistance from BCOs to new BAF formula, but we think that carriers will be more successful than in the past due to the wider market acceptance of burden sharing and the fact that lines started discussing mechanisms early with shippers, giving them time to iron out any teething pains. To cover more than one outcome, our freight rate forecast for 2020 includes two scenarios: the Base Case assumes that carriers manage to pass on 75% of the cost difference between the cheaper HSFO and dearer LSFO; while the Low Case scenario anticipates a 50% recovery, in line with recent trend. According to Drewry’s calculations, securing the higher rate of fuel recovery would lead to a profitable industry in 2020, whereas maintaining the status quo would result in losses that could trigger more consolidation in the market.